And the winner is… Option B! Option B received 32 votes, whereas Option A received only 18 votes. Several respondents observed that Option A looked much darker. A few even commented that the dark red in Option A looked like blood. Several other respondents also commented on the darkness of the single color in Option A as being evil and scary. Poll respondents frequently discussed how hopeful Option B made them feel. One individual stated, “I understand the dark red (selection A) and how that could portray the blood of Jesus, however I do like how (selection B) is darker red at the bottom and fades to the light yellow-type color at the top. Reminiscent of the story of Christ, the good and hopeful and the end.” In addition to describing the cover as hopeful, panelists also used words such as optimistic, warm, and uplifting. We’ve mentioned before how important it is to connect book design elements with the emotions your reader is looking for. Brightness, contrast, and color choices all play an important role in depicting that intended emotion. You might also find that while you think an image might portray one message, the audience could interpret it differently. In the case of this book cover, the designer may not have thought that the red in Option A looked like blood or looked evil. However, by split testing on a target audience, blind spots are often uncovered. 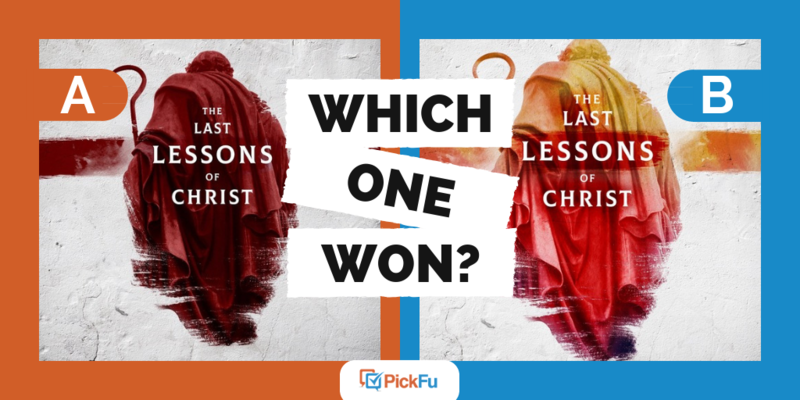 To make sure that your book cover reflects the intended message for your audience, create a PickFu poll to test it out.